If you're one of that small, brave band that likes Mark in video, he'll be back this evening, Tuesday, with a brand new SteynPost - and tomorrow morning, Wednesday, bright and early at 8.30am Eastern on the curvy couch at "Fox & Friends". SteynPosts is made with the support of members of The Mark Steyn Club, for which we're profoundly grateful as we approach the Club's first birthday. 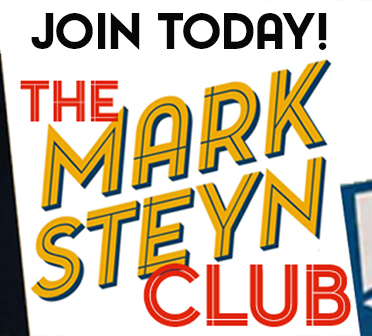 You can find more details about The Mark Steyn Club here - and, if you've a chum who'd enjoy our audio fiction, video poetry and much more, don't forget our limited-time Gift Membership. One of the comments on Twitter reminds me of the growing reluctance of people to give up the rat posteriors they hold. With Mayor de Blasio presiding over the gassing of rats today in Bushwick "to make the greatest city on Earth the worst place in the world to be a rat," there is a question of whether de Blasio might be behind a rat ring supplying halal carts with "the other, other white meat". A chicken sandwich being sold every six seconds would pose a threat to such a scheme. Last week, a de Blasio staffer was stopped with a loaded handgun with the serial number scratched off. Whether she was on her way to have a "New York conversation" with Chick-Fil-A is a question de Blasio has not answered. Nor has he said whether he asked The New Yorker for loyalty and then to prove it by taking the chicken legs out from the competition. It is of interest to all New Yorkers to have the rat population reduced, but an independent investigation is needed to determine if de Blasio colluded with The New Yorker to stifle competition. This was one of Tucker's best shows and not just because Mark had 2 short segments rather than one. The show was more informative than usual because the illiberal "liberals" and delusional, intolerant lefties were kept to a minimum. A few days ago, I ranted about how, "Fox's "fair and balanced" idiocy in the middle of a serious culture war has gone too far and is a recipe for disaster..." The disaster I was referring to is the loss of the culture war which so far seems inevitable unless more Americans can see the truth through the MSM's hysterical anti Trump smokescreens and if Fox rethinks its fair and balanced fantasy in a political world that is viciously adversarial and grossly imbalanced in favor of the left. I also wrote, "Laura Ingraham's fawning over Hillary sycophant Philippe Reines is despicable." When vicious Reines is on unrestrained mode, he's not someone I would ever voluntarily watch no matter who's interviewing him. Mark must have read my comment and passed it onto his pal Tucker because his 1st Dem was Philippe Reines himself. So much for having connections as a Steyn member. When Philippe is operating on full nasty, he makes Comey, Clapper and Brennan look like affable saints. However, Reines was surprisingly controlled when he talked to the master debater Tuck. Ingraham is a smart, usually affable but short-tempered woman and a competent TV host, but I was wondering if the alleged boost in her ratings was coming from the Dems. Perhaps, they believe anyone that is very fond of Reines must be on their side in this vitally important culture war. Tucker and Mark note that the New Yorker-ites offer no objection to the halal carts, comparable to their visceral hatred of Chick-Fil-a. That's because New Yorker-ites do not feel threatened by the halal vendors in the way that they feel threatened by committed Christians. They see themselves as always properly in charge of their world and as choosing to patronize the halal vendors, as a minor demonstration of their Big Cool. One suspects that they will one day be looking out on a very different scene. But then foresight is hardly their specialty. Word to the wise: as we mentioned in the other thread, spiritually clean doesn't mean at all hygenically clean to anyone from the sub-continent. What do people think halal means? The chicken was positioned towards Mecca and slaughtered by cutting its throat. That's it. Throw it on the floor on a stack of other dead chickens waiting to be plucked and feathers scorched. The halal shop in Delhi actually was the cleanest butcher we'd found, and had a refrigerator unit, so we only went there. It wasn't recommended because it was seen as 'more expensive.' Encouragingly, they had a nice clean stainless steel table top with a big chunk of bucked log on it that had a big U gouged in it from chopping mutton. But, the head butcher would shuffle in, slip off his flip-flops, climb up on the table, sit there and cut the whole chicken into parts with the knife held with his toes. He looked cleaner than the guys squatting on the chicken coops surrounded by flies in the other markets. So, it really didn't matter where one went for meat, that's how people in Pakistan and India learned how to quickly cut chicken and meat apart, holding the knife with their bare feet. As a practical measure, it does work quite well, like having four hands instead of two. But then they step down, shuffle outside in their flip-flops (now gouey with slime) and pee behind the tree and shuffle back. Being Muslim, they diligently wash their feet 5 times a day for prayers, but then shuffle back to completely contaminate their feet by even a short the walk across the filthy lot back to work. So, the immigrant guy on the NY street corner may have bought his chicken ready-packaged from the supermarket and is lying that it's halal or maybe he bought it cheaper from a hole-in-the-wall halal butcher, which may or may not have seen any health inspector ever, but don't assume without confirming that he has ever learned any hygiene concept of proper sanitary handling of whatever carcass he gets, including the concept of washing one's hands before handling food. In contrast, the dreaded Chik franchise has to be very careful to be in compliance to public health standards in food handling. "Cleanliness is next to Godliness." Sunday night we watched Silicon Valley. The head of a start-up gay dating site was inadvertently outed by the main character, and so horrified were his peers that he was asked to leave the coalition he was joining. Richard was acquiescing in this, but realized it was wrong and made a speech saying he was not going to discriminate no matter how heinous and disgusting this man's beliefs were. And what was it that so appalled everyone and made him a pariah. The man was a Christian! It was funny because it was so true. Satire hits the mark. Again. Ew! Christians! It's not like we live in America or anything. To paraphrase (and sorry if some of you are too young to get it), "Christians? You're soaking in them!" This is basically still a Christian country. (I am saying this as an unconvinced agnostic, by which I mean one who's unconvinced even which way she'd go once convinced.) It has and welcomes other folk, but the overwhelming dynamic is there, and I'm sorry that the New Yorker doesn't get it. New Yorker readers (I'm one myself, for my sins) need to read other things occasionally. I have to say, though, that they do fantastic covers. I've lately put up in my dining room prints of four Bruce McCall covers over the years (you can gauge the inflation rate -- on the New Yorker, anyway -- by the prices), and now there's this new one, of the greasy food truck and the artisanal kale food truck, with the added delight of each worker handing over his lunch to the other side. Next week, we had ... well, let's see. The "Spring Sonata," "Spring" from the Four Seasons, the Rite of Spring ... hey, am I sensing a theme here? There's one I don't get (pop, presumably), and several robins. The part about Venezuelans eating domestic animals reminds me of that old Aerosmith classic, "Wokking the Dog." Mark notes that past editors of the New Yorker would probably not have hosted the offensive anti-Christian, anti-Chick-Fil-a bilge. New York City hosts almost all world cuisines. And is proud to do so. Why should the New Yorker feel threatened by Chick-Fil-a? Isn't the real story here that New Yorker fans are beginning to feel more threatened generally, and thus are spooked by mere leaves flying in the wind? We should keep in mind that they were profoundly shaken by Trump's 2016 victory. They continue to be shaken because they were out of touch then and wish to remain so now. Not only do they despise Trump voters, they despise the people who predicted the victory. They do not wish to learn anything from them, even to their own benefit. If they are content to sit among the potted plants in their offices emitting spite about things that don't matter much, I predict the downhill descent of legacy East Coast media to continue. This really is the height of hypocrisy. These types of people will be the first ones to call the Christians "racists," and "white supremecists" and "afraid of brown people," but I can tell you firsthand it's the Christians who are taking in these refugee women and children along the ports of entry along the border and clothing them, feeding them and housing them in the local churches until the sponsors send them their bus or air tickets. When they leave, another couple dozen are coming to stay a while. And so it'll proceed until when? Also, among the groups are men who ICE has decided not detain and deport. They are reaching the US-Mexican border from Guatemala seeking asylum. They are being dropped off by ICE at area churches on the US side. I happened to be helping with one Christian church nearby this afternoon as they prepare for their annual spring yardsale fundraiser when one of the directors of the Border Servant Corps came in looking for small sizes in men and women's clothing. "They are all tiny," she explained. No, there was nothing but big clothing donated by average-sized people. So, someone will shop the second hand stores to get them all a change of fresh clothes for their next journey. There won't be any second-hand store handouts as they are operated like regular businesses. It will all be donations and purchases by Christians. Those horrid people! Where are all these sponsors, I wonder. How long will the Guatemalans stay with them? How will they survive here? They don't know a word of English. They have no skills. They don't know our systems. Will they be shown how to register to vote Democrat? This is insane but until something changes to stop this flow of Guatamalans coming here empty handed looking for help, I doubt very much it's the person writing that article at The New Yorker complaining about Chik-fil-A that will be pitching in. Tucker hit it on the head. Our so-called "intellectual class" is debased to a point that is now completely beyond comedic parody. How decadent, silly and morally frivolous do you have to be in order to accept and publish a piece implying that Chick-Fil-A is the thin end of a wedge that will transform all New York residents into Bible-thumping, homo-hating rednecks? I've been in Chick-Fil-A restaurants and I don't recall some sort of modern incarnation of Billy Sunday preaching to me about the The Word while I waited for my order. (Always fresh and delicious by the way.) Such an article can only be published for the purpose of (pardon the phrase) preaching to the choir and reinforcing the pre-existing prejudices of a certain type of parochial New Yorker who needs to have their daily dose of hate delivered in the form of a "respectable" magazine. It's ludicrous beyond belief. As to Comey - We are now witnessing the ugly truth about high-level bureaucrats in Washington, D.C. They consider themselves above and beyond the law and the strictures of "seemly" behavior. This is because Presidents, Senators and Congressmen may come and go but the Jim Comeys of the world are always with us. All Comey and Clapper and McCabe and all the rest are interested in is the continuation of their own power under conditions that they find congenial. Of course Comey was in the bag for Hillary Clinton - In his world she is "One of Us" - A believer in Big Government and the power of Big Bureaucrats. Everyone believes that this obstructionism was only motivated because Trump was elected President. It would have happened if Cruz, Walker, Paul, Rubio or even John Kasich had been elected, possibly with less naked hatred, but it would have happened nevertheless. As soon as the phrase "Drain the Swamp" gained popularity, the Swamp gathered itself to hit back and Comey is a leading reptile in that particular bog. On top of everything Comey has done this far, he shows himself more and more to be the most disingenuous person while he's purporting to be transparent. Even Stephanopoulus seemed to be trying to punch through that disingenuous "transparency." This all just makes it crystal clear the good guys aren't going to have their day, and the bad guys keep racking up the wins. Even if they lie and cheat every step of the way. They don't deserve to be in positions of power, but they are. I'm with Tucker on most things, but when he said something about not getting enough of Mark Steyn and thought we thought that too, I'm guilty as sin. Make the segments a little longer, Tucker, and keep the encore on the different topic. That shows Mark's keen abilities to take any topic pitch you toss out. I love the joyful camaraderie between Mr. T and the Big M. Kind of a Dean Martin - Jerry Lewis play-off. James Comey reminds me of Detective Frank Drebin in The Naked Gun stepping in (everything) to save the day. Jim Comey's brother, Peter Comey, works for the law firm that does the Clinton Crime family taxes. Looks like anti-Trump delusion runs in the family. Is there a Halal way to throw a chicken off a roof? Only if that chick comes with nuts. Hilarious! Comey's patriarchally emancipated women folk don't take their "marching orders" from him. Apparently he takes his orders from the matriarchy but is still a male screw-up who can't even do that right as he thought it was more prudent to resurface Hillary's insecure server before the election to avoid dealing with it when she was president. Yeah right. By the way, don't just label American academics as left wing fundamentalists - they are all the same in the west, particularly in the UK and Australasia (with the noble exception of my brother). As for the homophobic chickens, do you know where I can get some down under, as I rather fancy some eggs? Thank You again, Mr. Steyn! One of the last sane voices in America (along with Tucker)! The New Yorker has the early lead in next year's Pulitzer Prize voting. If they want to maintain it, they'll do well to investigate possible Russia ties as it relates to tartar sauce. The Left doesn't want Christians out of work and sleeping under a bridge, they want them to form a homeless caravan heading South to Central America on foot. It's another part of The Great Replacement. actually it is more likely that the leftists want Christians dead. Leftists us genocidal terms of marginalization reminiscent of other historical genocides. The leftists indeed want us dead, but would like to humiliate and torture us first. Their forebears, nazis and fascists (for they were of the left as well), would want it no other way. Our Lord did warn us, after all. In their time, the Nazis were opposed to the left. Left and right are arbitrary terms, aren't they? "Fascist" is now a disparagement tossed back and forth, but it's anachronistic. No one in the west comes close to meeting the definition of the 20th century, except the new arrivals the Islamofascists. Right and Left aren't arbitrary ... they derive from the French Revolution where those who stood to the right of the King were supporters of order, monarchy and tradition while those who stood to the left were supporters of the revolution, license, democracy, etc. It's pretty much the same today, however the left tends to twist the truth by painting the right as "authoritarian" when in fact it is they who are the totalitarians. They remain the revolutionaries; champions of license, chaos, and democracy. The right remain the champions of authority -- as in moral authority not state authority -- tradition, and order. Though it might seem that the right would be the ones to fear, in practice a well-ordered society of the morally self-governing ... who willingly submit to the moral authority of God ... is the most benign of the two. No coercive central government of giant mountain of laws is required in such a society. Once the people abandon moral self-governance however, chaos spreads, order is jeopardized and it requires an ever more powerful and coercive government to hold things together. The modern left. I understand that about being on one side or the other, but what is arbitrary about it is that there is nothing inherently different about either the left or the right. The right might as well be the left. The reason I think it's important is because the sticking of Nazis, from another era, at the far-right end of the spectrum taints the current, reasonable right badly; undeservedly so. If there were a better shorthand that were related to more fixed features, that very costly handicap would be alleviated. The Nazis were "opposed to the Left," so obviously they allied themselves with the Soviet Union. Putin, that old KGB man, was and is bad, so he's clearly a "right-winger." So has been every premier the Soviet Union ever had, except of course Gorbachev. He was good, so "left-wing." As for fascism, you have it right. A fascist believes in co-opting industry to the service of the State. That's pretty much the definition of the word, and its derivation from fasces tells you pretty much everything you need to know. It's not all that far from HRC's "stronger together"; in fact it's almost exactly alike. The fasces were reeds, easy to break one by one, but invincible once they were all bound together. Hitler's "Nazionalsocialismus" was also fascist, in that it essentially nationalized all industry, but there's no intrinsic reason that fascism should be racist or genocidal. Authoritarian, sure. Nationalistic, sure. And, again, the point of fascism isn't killing people; it's consolidating government and industry. Whether that in fact always does lead to killing people is another question. I think it needn't, though God knows the easy-to-foresee consequences are awful enough. Re: "Islamofascists," I think you're just using the word as you like again. Certainly the Islamofascists believe in "nothing outside the state," but they also believe in deuced little inside the state. Which makes their "fascism" more or less on a par with that Afghan game involving chasing a dead goat around a field on horseback. If you look up "Communism" in the dictionary, you might get "a system in which goods are owned in common and are available to all as needed." If you summarize the definition from The Black Book of Communism", you might have something like "state terror that caused the deaths of 100 million people". History is where the definitions of communism and fascism are found. Fascism encompasses a great many things. Many dictatorships off-handedly thought to be (say, by Americans in the 20th century, looking at South American regimes) fascist, were, under closer inspection, found not to meet the criteria. Islamofascism does include key items conspicuously missing from the dictatorships that don't qualify as fascist. But it's not the same fascism of Hitler, Tito, and Mussolini. It's a unique blend; hence the fusion of two words. Modern-day Venezuela is a fascist state by any definition I know. It has its entire economy wrapped up into one industry, in practice government-owned, and that rapidly failing; it has insane hyperinflation and people fleeing to such safe havens as Colombia (!) to avert the wreck. Toilet paper is currently a luxury item. Caracas has the highest murder rate in the world, which is saying something when you have to compete with Chicago and Detroit and South Africa. And yet there are gazillionaires there. Wouldn't it be an Uncle Tucker, or an Uncle Mark march?